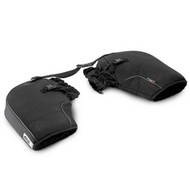 Dainese D-Tail Saddle Bag Black. Practical saddle bag with aerodynamic design with different compartments for optimum luggage distribution. Expandable main compartment incorporating a practical key holder. 2 moulded outer side pockets. Waterproof cover in the outer pocket. Lower part made of non-slip reinforced neoprene to protect the bike's paintwork. Universal fitment system with straps for a secure hold. Approximate measurements: 17.5 x 33 x 35.5cm.